I’ve seen too many trailers for The Poseidon Adventure to ever want to take a cruise. I’ll drive anywhere, and will voluntarily take a plane if I have to, but water – uh, no, thank you. I have a real fear of ending my life as fish food. My husband said he’d do it in a heartbeat because he’d be so far away from the lights on land that he’d be able to see all the stars and he really wants to see the whole night sky with all the stars. Humans have always loved stargazing since the beginning of time. We’ve named them, drawn figures around them, used them as guides, and told tales about them. I guess it’s in our DNA to want to know about them because scientists say that we are made of star stuff. Even ancient cultures knew more about the stars, the seasons, and the cycles of the natural world than I do – and I watch the Discovery Channel religiously. The Star of Bethlehem has always been a source of wonder and story and throughout the ages artists have attempted to paint it. They’ve usually made it big and bright – sometimes placing it directly over the manger even occasionally vying for position with the angels. Musicians have composed carols and popular songs about it; “Star of Wonder, Star of Night, Star with royal beauty bright…” We put stars on our Christmas Trees, on our street lights, on our advertisements and over our doorways. But I’ve often wondered – if the Star of Bethlehem was so big and bright, why didn’t anyone else notice it? Why don’t we have records from other civilizations about an unusual light in the sky? Why didn’t Herod know about it before the Wise Men showed up on his doorstep looking for directions? Evidently he had a couple astrologers on staff because just after he fibbed to the wise men he got them all working on the problem of the prophetic light of a rival king. Why didn’t they see it coming? 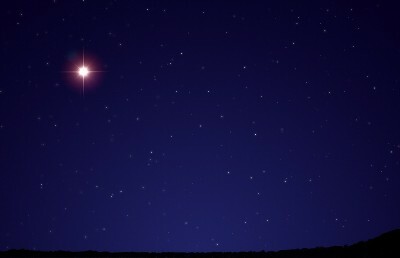 Perhaps the reason that no one noticed the Star of Bethlehem was because they weren’t looking for the one that was there. Maybe it wasn’t very big at all, didn’t shine brighter than the noonday sun and it didn’t have a tail as big as a kite. What if it were just an ordinary, garden variety star that appeared on the horizon one morning just before sunrise in an area of the sky where it wasn’t the night before. We know from legend that the three wise men were astrologers. Many ancient cultures were skilled in reading the stars and other heavenly bodies, and the astrologers were very familiar with the sky. If something new would have shown up, they’d have noticed. In fact, the sighting prompted them to immediately pack up their things and undertake a treacherous journey through unfamiliar lands and cultures. It was worth it to them to see this king of the Jews because they had read the prophecies and understood their meaning. I wonder if they were a bit confused when the star led them to a little rinky-dink Jewish town and that the new-born king appeared to be nothing out of the ordinary, no different than any other child in the vicinity. It’s funny when you think about these road-weary men who finally got to the end of their journey only to find that the King of the Jews was a poor little boy with ordinary parents in an ordinary house. Yet, unfazed, they still bowed before the child and offered the gifts they had brought for the king they were seeking; Gold, a gift for a king, Frankincense, a gift for a deity, and Myrrh, a gift for the Man destined to die. Later, when they realized that they each had the same dream that warned them not to return to Herod’s palace, they navigated another route home and disappeared into the pages of Salvation history. There were hundreds of people living around the house of Joseph and Mary, and not one of them saw this child as anything but another child. They were waiting for their Messiah to show up, like the Star of Bethlehem, as someone big and bright and out of the ordinary. Unlike these three astrologers, they wouldn’t have been able to accept that the Messiah was already with them in the ordinary day in and day out of their lives. There are so many lights around us that it’s almost impossible to see a winter’s night sky without having to trek the globe to find enough darkness. If the Star of Bethlehem had appeared today who would have been able to see it? Maybe it would be noticed by someone at NASA, whose job is to scan the skies for Extra-Terrestrial visitors or Near Earth Objects, but they’d probably only map it, not knowing it’s real meaning. It would be marked as a point of light among billions of other points of light. Could it be that we are just like the people of Bethlehem? Are we able to see the miracles that are all around us in our ordinary day in and day out? Are the lights of our age distracting us, keeping us from seeing the true light because it’s a point of light among billions of points of light? Could it be that we’re following the same lights that are keeping us from being stargazers? So today I’m going to pack up Christmas, wrap it in tissue paper and put it back in the boxes to be stored in the garage with the lawn mower, but as I do I’m going to make a resolution. From now on I’m going to pay more attention to what’s really happening in my ordinary life. I am going to listen to more silence and gaze at more stars because I don’t want to miss anything. This entry was posted in The Church Diva and tagged Astrologers, Catholic, Epiphany, faith, Light, Stars. Bookmark the permalink. Lovely, so delighted to have found your blog. Much light to you in the new year!